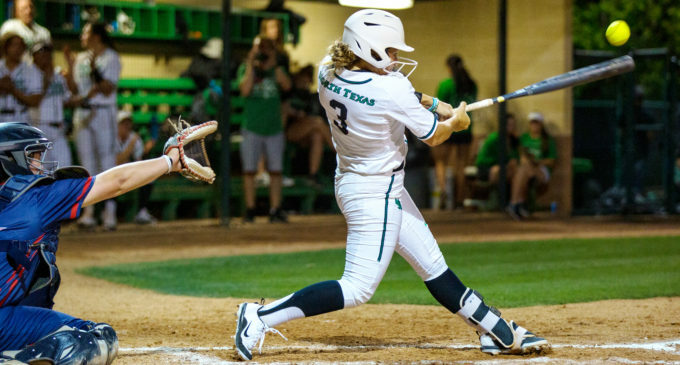 The North Texas softball team (26-15, 11-4 Conference USA) lost their rubber match against Western Kentucky (29-9, 12-3 C-USA) on Sunday 8-0. North Texas was able to split the day on Saturday against the Hilltoppers, winning the first game 8-2 with contributions from sophomore pitcher Hope Trautwein and sophomore Katie Clark. Junior Harley Perella and freshman Tayla Evans had RBIs. DeLong expressed reassurance on the team’s position in conference. The second game on Saturday was tight with Tindell and junior Jenna Goodrich leading the rotation for the Mean Green. However, North Texas fell to the Hilltoppers in game two, 3-1. Trautwein started the third game at the mound for the Mean Green and took her sixth loss on the season, making her 17-6 in 2019. She pitched for 2.1 innings, allowing four runs on three hits and strikeouts. Freshman Bailey Tindell relived Trautwein, allowing four runs on five hits in three innings. North Texas head coach Rodney DeLong said he wasn’t happy with the pitching effort from his team, but he also didn’t think the officiating for the series helped. The Hilltoppers jumped out to a three-run lead in the first inning off a home run from sophomore Kendall Smith. Junior Kelsey Aikey and her defense held the Mean Green scoreless for the game, only allowing one hit through the five innings before winning in run-rule fashion. DeLong credited Aikey’s efforts against his team. North Texas now sits at second place in the C-USA Western division, a game back of Louisiana Tech and the Hilltoppers currently sit atop the conference. DeLong is still confident in the Mean Green’s chances as they enter the final stretch of the season.